Each year there are a huge number of workplace accidents reported to the HSE. 40% of these accidents are a result of slips, trips and falls and cost employers £512 million in lost production. By using common sense and following workplace safety procedures slips, trips and falls can become a thing of the past. So join us as we look at the causes of such accidents in today’s blog and share our top safety advice on how to prevent them. The majority of claims relating to slips, trips and falls in the workplace are related to work at a height, usually involving a ladder. How to prevent accidents: Make sure you have a good understanding of how to work safely at a height. 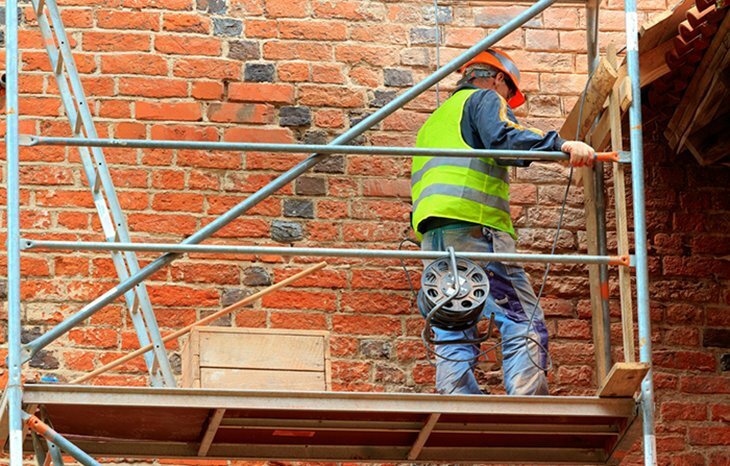 If you’ve had a break from working at heights, or don’t do it regularly, make sure your employer gives you the appropriate instruction on the safe use of ladders. You may also like to refresh your knowledge on our Working at Heights Training Course or our Ladders & Steps Training Course. Wet floors, as a result of cleaning or spillages, can be a major slip hazard in the workplace. How to prevent accidents: Firstly, all spillages should be cleaned up promptly to prevent accidents. In areas where slips and trips are likely, handrails should be installed. Workers should also wear shoes with an anti-slip sole and be made aware of all potential slip hazards through signage. Inappropriate lighting can create glare on a shiny floor, while poorly lit spaces could prevent workers from seeing potential hazards. How to prevent accidents: Improve lighting in all areas of the workplace to ensure the right type of lighting is installed for the job. Often, playing around with the placement of lighting can make a huge difference. If lighting is always going to be a struggle, it may be worth inserting handrails in the area and putting up better signage / floor markings. Any item that causes an obstruction, or flooring that quickly dips or steps down without warning, can lead to a trip and fall. How to prevent accidents: Improve housekeeping in the workplace and ensure that any obstruction that can’t be moved is clearly highlighted. Employers also need to make sure that flooring is fitted correctly and properly maintained. Handrails and markings should be used to highlight changes in level. Any accident or near-miss must be reported to your employer so they become aware of workplace risks. They can then use this information to prevent future accidents. Be mindful of your work environment, cleaning up any potential slip and trip areas and helping colleagues out when you spot danger. If you are given PPE, wear it. It’s there for a reason. Always carry out a risk assessment when approaching a job that may carry risks, no matter how small they may be.